His seemingly off-hand remarks signal a potentially sharp shift in U.S. defense posture in East Asia. WASHINGTON — President Trump announced a halt to joint military exercises with South Korea on Tuesday, raising alarm at the Pentagon, in Congress and among allies that the U.S. might back away from longstanding defense commitments in the region without concrete concessions from long-belligerent North Korea. Trump unveiled the move at a news conference with North Korean leader Kim Jong Un after their summit in Singapore. He said he also wants to eventually withdraw the 28,500 U.S. troops permanently stationed in the South as a deterrent against North Korea, which until just months ago was threatening Seoul and Washington with nuclear war. Administration officials said halting the joint exercises is a relatively modest concession that has great symbolic importance to Pyongyang. By helping to build trust between two longtime adversaries, the officials argued, the U.S. action could make it more likely that Kim will move forward on talks aimed at eliminating his nuclear arsenal. But Trump’s seemingly off-hand remarks, without warning to allies South Korea and Japan, marked a potentially sharp shift in U.S. defense posture in East Asia and contradicted decades of statements by American officials that the exercises are defensive only and critical for deterring North Korea. The decision was quickly portrayed by critics as a one-sided giveaway to a country that maintains one of the largest standing military forces in the world. The annual exercises, which include warplanes and naval maneuvers, have been held since at least 1976 to help the allied forces prepare for a possible North Korea attack. In response to Republican senators’ worries, Vice President Mike Pence reassured them that smaller, routine training exercises will continue, according to Sen. Cory Gardner, R-Colo.
Pentagon officials have long believed that the much larger, yearly exercises deter North Korea and improve the readiness of U.S and South Korean troops. Former military commanders who worked in South Korea say the drills are essential in a foreign theater where rank-and-file service members, their officers and the civilian analysts who support them turn over annually. This year, four separate exercises were conducted from early April to late May. 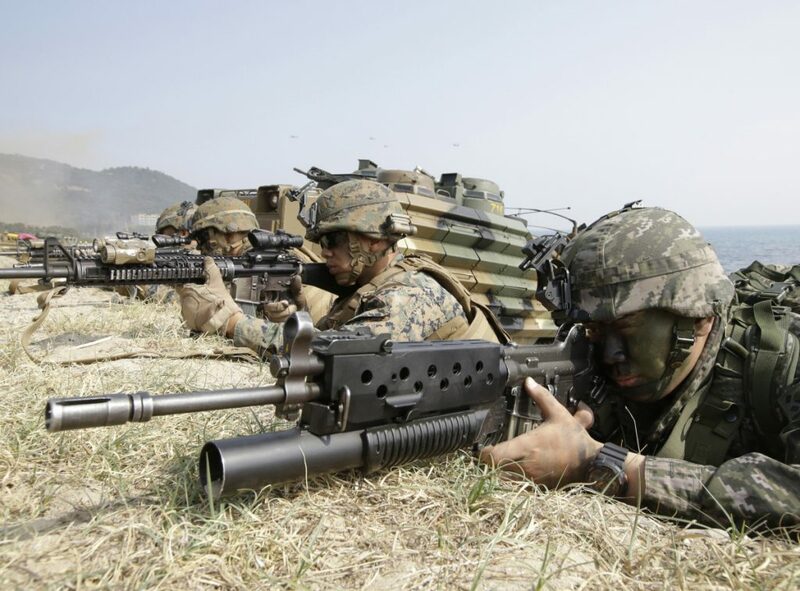 One, called Foal Eagle, involved 11,500 U.S. and 290,000 South Korean troops. It was followed by Key Resolve, which used computer simulation of a possible attack by North Korea to improve headquarters command and control. Suspending all such drills without parallel concessions from Pyongyang could make reaching a larger deal on restricting North Korea’s nuclear arsenal even tougher, said Michael Green, senior vice president for Asia at the Center for Strategic and International Studies. It takes away leverage from Secretary of State Mike Pompeo, who is expected to lead continuing talks with North Korea, Green said, and “is heartwarming for Moscow and Beijing.” Russia and China have long joined North Korea in denouncing the U.S. maneuvers in South Korea as a rehearsal for invasion. The move could also impose a de facto timeline for making progress in the forthcoming nuclear talks because, with another round of military exercises scheduled for late August, Pompeo may want to see concrete actions out of Pyongyang by then, said Victor Cha, formerly a national security adviser to the George W. Bush administration. Trump’s announcement apparently caught U.S. military commanders and officials in South Korea and Japan by surprise. Both countries have longstanding defense treaties with the United States. “There is concern for both allies,” Cha said, “that Trump does not really value alliances and commitments. They are seeing their issues become bargaining chips” with Kim. Green, the Asia scholar at CSIS, said it was “astonishing” and “unprecedented” for an American president to tell an adversary like Kim of his military plans before informing affected allies.